Before coming to UIC, the Wheaton, Ill. native was a double major in French and African studies at Stanford University. He wanted to study abroad and took a break from school to work in Africa. In Africa, he was living off the grid. Energy came from solar power, he had fetch and sanitize water, traveling was via bike, and his only communication home was the occasional satellite phone call. It was this experience that turned him on to renewable energy, off-grid living, and natural resources. It was this experience that changed his life and lead him to switch his major to Earth Systems when he returned to school. 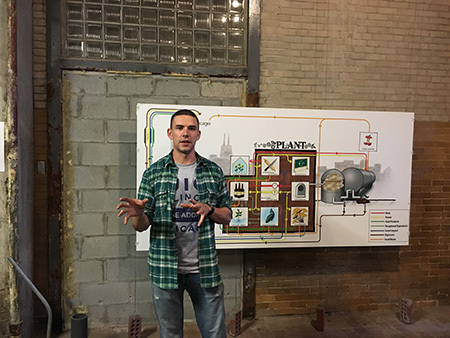 According to Mulrow, a big part of self-reliance is a strong technical capability, and that is why he chose to pursue an engineering degree at UIC. While earning his degree he was able to implement new engineering concepts at Plant Chicago, where he is the vice president of the board of directors and served as the interim executive director for nine months. Joining the National Guard is something he always wanted to do. It�s also plays a part in his long-term plans. More student, faculty and department news can be found at CME.